Most of our summer vacation this year is planned for the British Isles. It has been my mother’s dream to see Scotland, so she has accompanied us. First stop – Edinburgh. Before we reached our destination, we had to get through the challenge that is modern air flights. Our original carrier was Continental into Newark and then a six hour flight into Edinburgh. I was really looking forward to a relatively short flight and find Continental to the most comfortable of the US airlines I have used. Unfortunately we could not get into Newark in time so Continental changed our itinerary to board Delta Airlines via Atlanta and London, an additional stop and six hours. The upside is that we were upgraded to first class for the transatlantic portion of the trip. We trustingly boarded the first Delta flight, moved to the last seats on the plane, (over the engines) and flew to Atlanta. At that point we were issued economy tickets because Delta would not recognize the upgrade from Continental. After spending an hour on hold, Mike got a supervisor from Continental to speak with Delta. The folks at Delta refused to speak, listen, or change the reservations. Continental advised us to accept the situation with a smile as Delta could label us a security risk. The London flight was over an hour late so at nearly midnight we boarded our plane. To assuage our disappointment, Delta allowed us to board with children in strollers. Yea us! We arrived late to London with just the right amount of time to catch the flight to Edinburgh – which had been upgraded to business class. The only difference between business and economy on British Midland is a cup of tea and a biscuit. But they were quite nice. Finally at around 6:00 in the evening, we arrived in Edinburgh – pronounced Edinburah (rolling Scottish burr at the end.) Our hotel, the Apex International, a local chain was very comfortable, We ate our first meal at a local pub. I don’t drink beer but have found that the pubs carry hard cider, which is very refreshing. The next morning, we ate a typical Scottish breakfast and yes I tried the Haggis. While it sounds quite vile, I found that it tasted kind of like sausage and oatmeal. We then set off to find where J.K. Rowling wrote the first “Harry Potter” book. 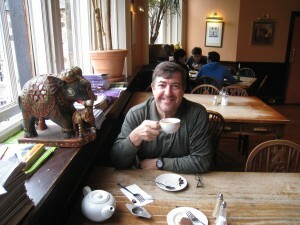 It is now a tea place, called “The Elephant House.” You can see Edinburgh Castle through its windows and understand how the world of Hogswart was inspired. Our stay in this historic city was short. We were due in Ballater by 4:00 so Mike rented a car and learned very quickly how to drive on the left side of the road.